How expensive is your city? Are there any bargains to buy in the countries close to you? Check out everything from food, beer, cinema tickets, fitness studio and more. Most of the big world citys are already listed. We tried out Expatistan and found their service for comparising different cities and their costs quite interesting! 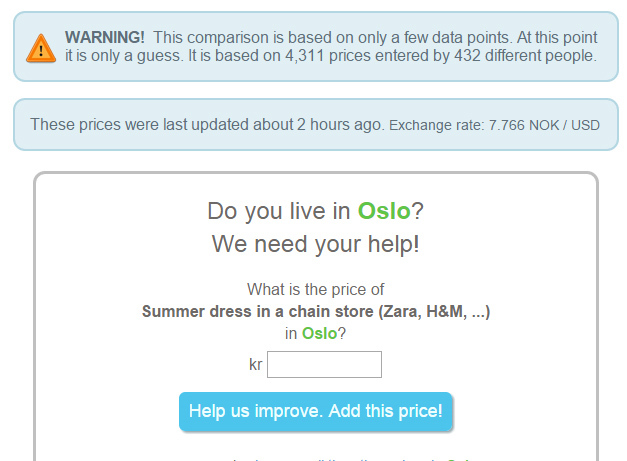 Expatistan shows that both cities are quite expensive, but clothing is 41% more expensive in Norway than in the United States! We like this service, and we would suggest you to take some few minutes to help sites like Expatistan to be even better! 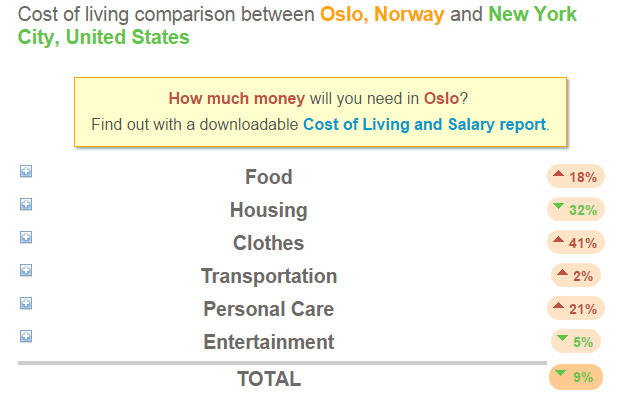 We were also surprised how much cheaper the public transport is in Oslo compared to New York! While a monthly ticket card costs only 660 kroner (78 Euros) in Oslo (only for Zone1), a similar ticket card costs 2063 kroner (244 Euros) in New York! If you live a bit outside of Oslo, for example next to the airport of Oslo, Gardermoen, you will pay 1740 NOK (205 Euros). The other transportation costs are cheaper in New York than Oslo! E.g. one litre of gas is less than half price in New York! A taxi trip is 70% cheaper in New York. While a brand new VW Golf car will be 13% cheaper in New York! Well we know already, no other country is more expensive than Oslo when it comes to entertainment, food and drink. When everything is counted, nothing is more important than housing! 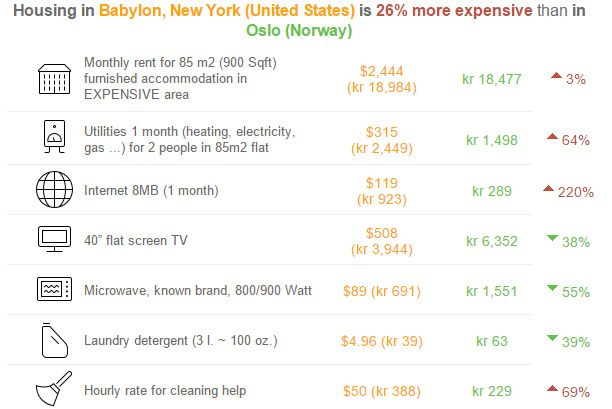 To rent a flat costs incredibly almost the same in Oslo as in New York, even in an expensive area of the city! Internet is extremely expensive, 220% more expensive in New York than Oslo! And the hourly cleaning seems to be more expensive in New York than in Oslo… Well we are not completely sure of these prices are correct, as nobody have higher salaries than Norwegians, no matter if they clean a house, works in a super market or is a lawyer! It’s also possible to download a detailed salary and tax report from Expatistan to get a better understanding of the real costs in a city. However, after using Expatistan for comparing of costs in different cities, we have got a good impression of their service. Expatistan is easy to use, and it’s a stable friend, and part of our research before we are going on holiday or plan a city to stay in for a while. But the service is dependent by active users, and not only active readers, but contributors, that give prices, not only for metropolitan cities, but also smaller cities. If the contributors dont update the prices frequently, the service becomes outdated, and it loses relevance! We found the service quite interesting with many relevant products to compare. Score: 4 out of 5 Dots! Numbeo pops up with registration window! We also had a look at Numbeo, another simiar price comparison service. We found this service a bit more annoying, as it has a pop-up window where they want us to register, before we even have started to use the service! It is good that the service is free, but they want us to type in the e-mal address so they can send weekly newsletters. We are not a fan of those e-mails! However, Numbeo is (just like Expatistan and most services online) dependedent by active users, and we understand that. Numbeo has also other functions than only price comparison, like crime comparison, how safe one city is compared to another… This is quite interesting too. You can even see that Oslo seems to go in wrong direction during the last 3 years according to their statistics! Similar statistics can be found for pollution, health care, traffic, quality of life and travel (taxi calculator, gas price calcultor and hotel comparison)! Including a large section for property prices! All in all, we find Expatistan’s user interface more modern, easier to use. Expatistan gives more white space on every page, so you can relax, and it’s easier to concentrate. While Numbeo possibly is more detailed and contains more information. We think there’s a market for both services! SCORE: We give Numbeo 3 of 5 Dots! Eurovision in Copenhagen 70 Million over Budget!